Action packed art, just like the movie itself. The problem with the Ten Gladiators series were the titles. 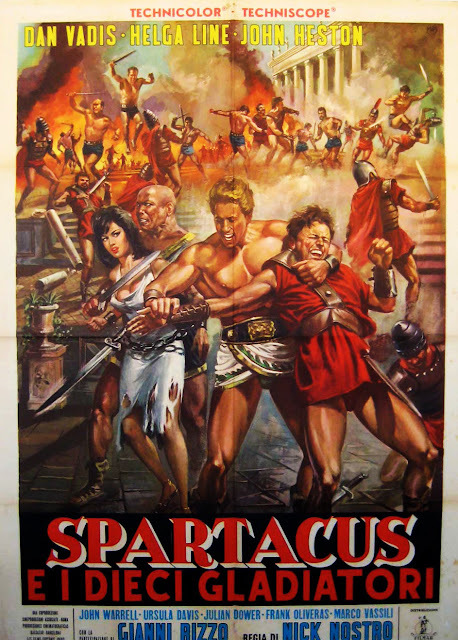 The first film was called THE TEN GLADIATORS. There were two other movies made, including THE TRIUMPH OF THE TEN GLADIATORS and this one, which has SPARTACUS before the Ten Gladiators. For film libraries and books, titles are usually listed alphabetically, which places these titles far from each other. This is actually a common problem. Even the Indiana Jones series had to do a work around about this: the first film was RAIDERS OF THE LOST ARK but every subsequent film were titled INDIANA JONES &____ . This placed the first film elsewhere than the sequels so they had to re-title the first film, INDIANA JONES & THE RAIDERS OF THE LOST ARK. Ah. So that's why they're calling it Indiana Jones and the Raiders etc. Frankly, I think they should have left out Raiders of the and called it Indiana Jones and the Lost Ark. (But then they'd have had to change the title in the movie itself, so... eh.